In this group game, predict and out-think your opponents’ choices. Discard all but one of your ingredients and win. Listen to our wizards’ impressions or read on below. 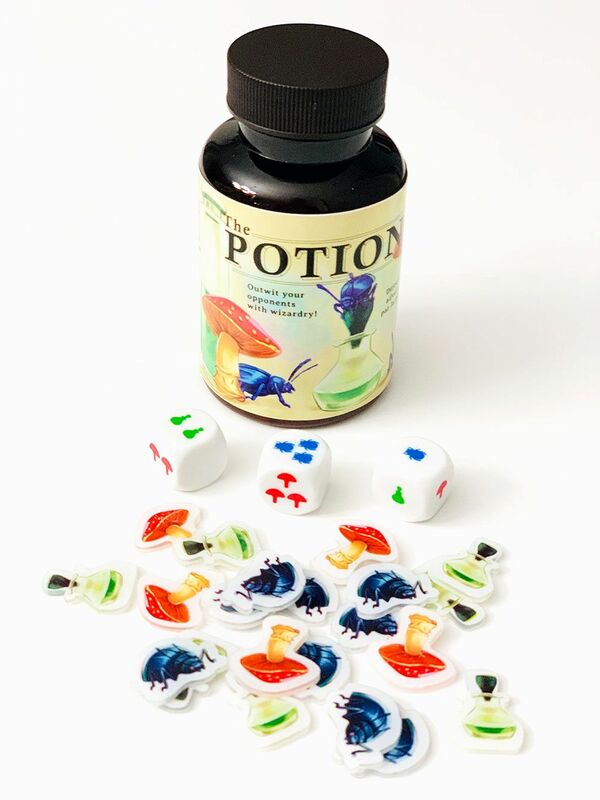 Gather at least three players to play The Potion. Each gets two mushrooms, two vials, and two beetles. They keep them secretly in the palm of one hand. One player rolls the dice. Then each person decides which single ingredient to play from their hand, in the hope that they will be able to discard it into the bottle. All players reveal their chosen ingredient simultaneously. If some (but not all) players’ ingredients exactly match a die face, those ingredients go in the bottle. For example, in a game with four players, the three dice show: two beetles, one vial, and one blank. If Nick and Izzy both show beetles (and no one else did), their two beetles exactly match that die. In a twist, you may also discard if you are the only player showing an ingredient that does not appear on any of the dice. 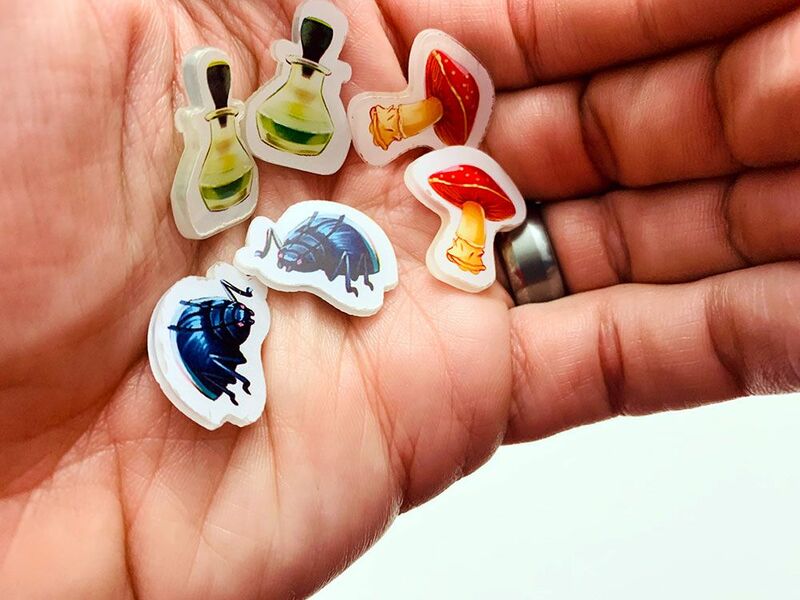 When one player has only one type of ingredient remaining in their hand, they win! Thematically, The Potion is great. We love that the ingredients are small plastic tokens, not cardboard. The bottle that contains the game is compact and easily portable, and is even used as part of the gameplay (when discarding). We found it easy to teach to a five-year-old, and think it would make a great restaurant game. The Potion is all about predicting your opponents’ plays. Do you want to match with other players, or try to be the lone wolf and go opposite of everyone else? Maybe you want to match a player who is about to go out, pushing the ingredient count too high? The more players you have, the harder it is to predict and remember what everyone else has. We had a lot of moaning and table talk as we played in a group. Sometimes the competition got heated, but games were still quick and fun. Our only dislikes relate to the rulebook. The booklet easily gets stuck inside the bottle, and we ripped it trying to get it out. We also wish the booklet had a few more examples of play, since the matching rules aren’t intuitive, which led to some heated arguments. Ultimately, we really like The Potion, and it’s become a common restaurant game for our family. The Family Gamers received a copy of The Potion from FoxMind Games for this review.